5793 labyrinths found. Showing 1841-1860. Sorted by country, state, city, then zip/postal code. This historic native stone United Methodist Church is 18 miles north of the Napa Valley on Highway 29, one block east of Calistoga Street in the heart of Middletown, California in southern Lake County. The Rainbow Labyrinth is open to the public. Located in the sanctuary of the 121 year old historic Middletown Community United Methodist Church on the 2nd Friday of each month from 5 - 7 pm and the 2nd Saturday of each month from Noon to 2 pm. Six finger labyrinths are available for persons with mobility issues. Take Highway 99 north exit 229 or south exit 230, Briggsmore/Carpenter Rd. go east towards Orangeburg, first right turn, 1.5 mi on Orangeburg, stay in right lane. Cross Tully Rd. just past Fremont Elementary School, church parking lot is on right. Labyrinth is at front of church. David Callaway, Eagle Scout (right), with some of his helpers. Our 5-circuit Medieval labyrinth is located on the back driveway on our campus. It is made from bender board and gravel. People walking the labyrinth on dedication day, Sunday, Sept 7, 2015. 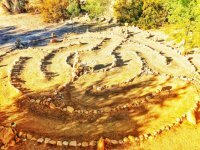 The Labyrinth is located behind the sanctuary (outside) and is available 24/7. There is a large cross at the center - made from a dead eucalyptus tree that was "brought back to usefulness" by a local Eagle Scout - on behalf of the church, for which we are grateful. This is a large classical labyrinth - built with stones and decomposed granite paths. A large cross is found in the center. One path leads both in and out. Freeway 10 to Hwy 62 N, Little Morongo N, Terrace Dr. The labyrinth site is at the end of the road on Mount Shasta itself, just south of the Panther Meadow trailhead. Most of the year, it's covered by snow and the road is closed before you get to the trailhead. The labyrinth itself comes and goes annually because of the snow and human activity. Labyrinth is open mid-June to mid-July, other times by appointment. David E. McGee-Williams, Ph.D., Gail Winslow, Ph.D. Please be respectful and safe, thanks. I found the pattern on the internet and modified it to fit the site; it is perfect for a front yard. At north end of Napa off Hwy 29 - go east 1/2 mile-church is on left and labyrinth is on property right behind the sanctuary. On Sunday mornings we would invite people to join us for worship at 10:30, walking the labyrinth either before or after that worship experience. Open to the public Mon-Fri from 11 am to 2 pm, and at other times by arrangement. Hwy 49 N of Nevada City, right at Oak Tree Dr., Left onto New School Rd. Labyrinth is in field on right, under oak tree. Exit the 101 Freeway at Wendy Drive and turn left. Follow Wendy to Borchard Road and turn right on Borchard Road. Park entrance is on your right. For best handicap access, turn left at Wendy Drive. Follow Wendy to Gerald Drive and drive to the end of the cul-de-sac. This will place you in a handicap space with a direct wheelchair accessible curbcut and a graduated ramp up to the labyrinth. Grand opening ceremony on Saturday, September 18, 2010, at 11am. 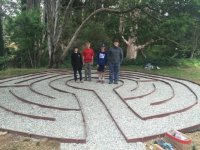 The labyrinth may be accessed between 3-4 p.m. on weekdays with permission from the school office. Located at the base of the Newport Pier, in McFadden Square; completed as part of the McFadden Square Centennial Legacy Project, contains markers designating events in Newport Beach history. This labyrinth is not open to the public, but they do have regular labyrinth walks once a month. All are welcomed with a reservation. This Labyrinth is only open through workshops which are held monthly. See www.nohonewthought.com for schedule.